Check it out! All the pics are finally in at the Sheldon Photo Gallery! It's a collection of every Sheldon event, gallery show, book launch, convention, and reader-submitted pic! 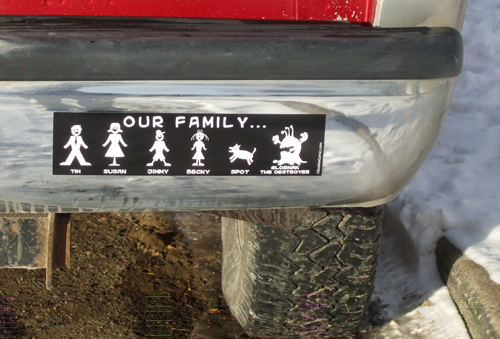 After first recieving my bumper sticker, I shined up my truck and displayed it with pride. You can see it in the before picture. Unfornately, driving to work one day, a patch of ice wanted a word with my truck. The patch of ice decided to tag team my truck with assistance from a concrete median. Fortunately, not many were hurt. Unfortnately, Glornak was wiped completely off my sticker. He must have had to go home or had over stayed his welcome in my family. You can see in the after picture. The saddest part of all, equal or greater to the damage to my car, is that I no longer have an awesome bumper . 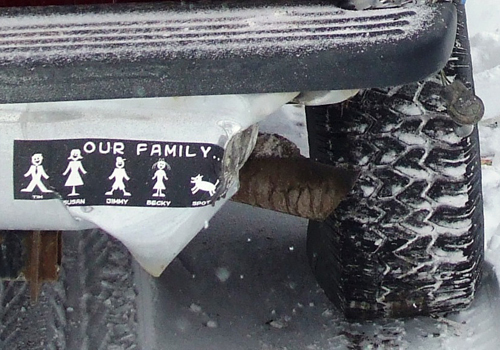 Susan, I may not be able to replace that bumper, but I'm sending you a replacement Glornak sticker right now! It's the least I can do for a near-bumperless Sheldon reader!